Use a high quality QR Code generator when you create QR Codes. Ensure that you can always modify or edit your QR code links. The only way to edit a QR code link is to use a high quality QR Code generator that allows you to change the destination link after you generated it. If you are looking for a professional and stable QR code generator - then Splitter is the tool for you. 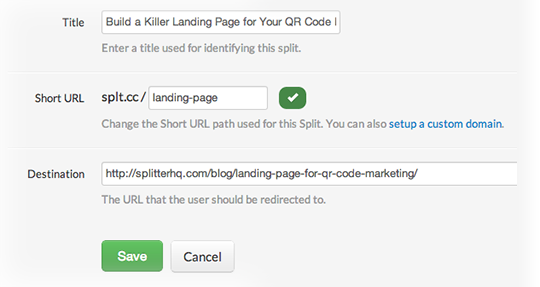 Besides the ability to edit the destination of QR Codes at any time, Splitter also enables you to generate intelligent QR Codes and short URLs. Our QR Codes and links can detect where your customer is located and what device she is using. Based on this, we can redirect her to different landing destinations based on your conversion preferences. Redirect mobile users to a mobile friendly version of your website. Detect what country the user is from and redirect her to the correct language version of your website or social media profile. Redirect mobile or tablet users directly to the right app store based on the device type (iPhone, Android, Windows Phone etc.). Show different links based on date and time.